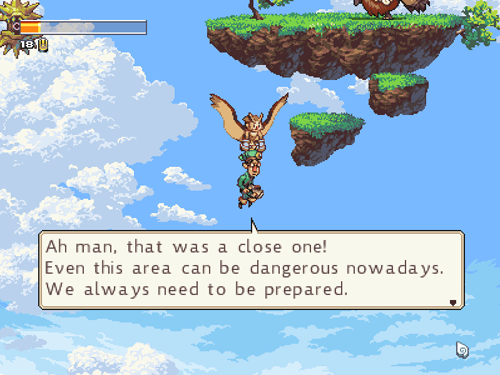 Owlboy, from D-Pad Studio, is coming to consoles soon... Well, soon-ish. The game was in development for nearly a decade, so it's a comparatively short wait. The game will be hitting PS4, Xbox One, and Switch on February 13, 2018, and if you haven't already purchased it for your computer, you should definitely give one of the console versions a go, especially since it's inspired by the classic console games of yore. Plus, Owlboy was our 2016 Game of the Year. Check our coverage here. Owlboy is a game about a student owl named Otus who wears a cloak that allows him to fly. The world in which he lives is made up of a series of floating islands, which has recently come under attack by sky pirates. Otus has set out on a quest to stop the sky pirates and save his home village of Vellie. But in order to do this, he will need some help. Otus is a more-than-capable platforming hero – especially given the fact that he can fly freely – but he is lacking in offensive abilities. He has a spin attack that knocks enemies back, and he can pick up items such as rocks and toss them at the baddies, but he has no projectiles of his own. To assist him in this department are a number of gunners that can be carried through the environment, and the player is able to use them to aim and fire in any direction. At first, the player will have access to only a single gunner, a somewhat meek friend named Geddy, who has the advantage of firing at a high rate of speed. Throughout your journey, you are able to recruit new gunners, and switch between them at will, giving you a number of different offensive options. Each gunner has different projectile types and firing rates.